You are here: Home / Sketchnotes / What Are Sketch Notes? 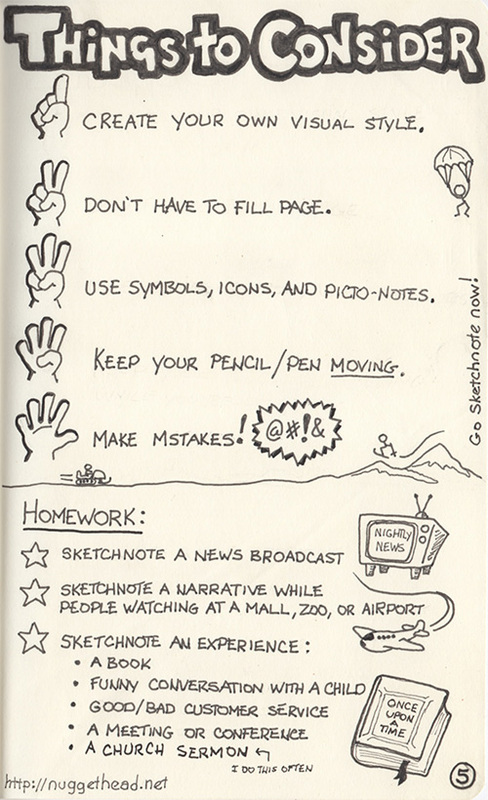 Basically, sketchnoting is doodling while you’re taking notes. I’ve been doing this ever since I got in trouble in the 2nd grade for drawing Dr. Seuss characters when I was supposed be taking a quiz. I’ve got a library of Moleskine sketch books littered all over the house today. I have one for Sketch Quotes (more on that in a future post), one for character development, and even one I call my ‘Sunday Sermon Sketchbook’ where I sketch in church every week. I’ve tried converting to taking digital notes by means of various apps on my iPad. Whether it’s a well-built note taking app or an app that mimics handwriting in a notebook, I always come back to my trusty pencil. There’s just something about the simplicity of a pencil’s carbon scraping across the fibers of paper that no fancy app can duplicate. 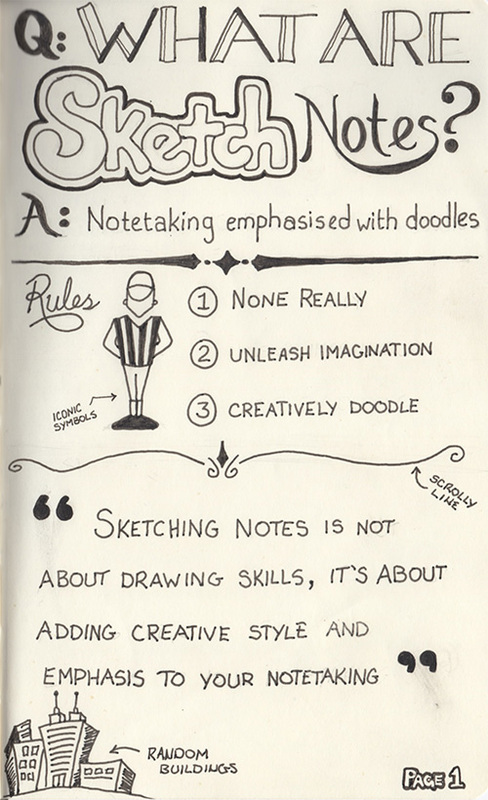 Some time last year I Stumbled onto the Sketch Note Army’s site. Whooda thunk there was an army?! There’s a lot of great information out there (the interwebs) about doodling, visual note taking, books, communicating concepts with simple doodles, and more. I started these pages about three months ago and it wasn’t until recently that Mike Rohde’s new book, The Sketchnote Handbook came out that I was inspired to finish them. Nothing fancy. Nothing about what the research says. Nothing about theories. And certainly nothing about skill. Just plain ‘ole sketching notes. Note taking emphasized with doodles. Go with what’s natural and comfortable. The more you practice, the more creative you will become. Tip: If you already have notes you want to convert, lay them out in pencil first. Then trace with a pen or marker and erase the pencil. Grab a pencil or pen right now a sketch the first thing that comes to mind. You know you were just inspired or you’re thinking of something. Don’t lose that feeling and take the next five minutes. GO! I’m going to be traveling quite a bit to various conferences in the next few months (see sidebar). I intend on sketchnoting each of them with a posting of those notes here. If you’re attending any of these conferences, look me up. I’d love to see your sketchnotes! Hey Tracy! They’re supposed to be different results. That’s the beauty of it – it’s “your” style. Dilbert is clearly not very sophisticated artwork, but Scott Adam’s style is unique and ‘different’ than comics had ever seen. There is no try. Do or do not. 🙂 Seriously, just practice. The more you practice, the more your style will surface. Thanks for stopping by. 8.5 x 17 is quite a large notebook! 🙂 I work on that size bristol board with a series of H pencils (no eraser) often, too. Those times are for when I’m doing actual drawings or comic pages. When sitting in a meeting or attending a conference, taking notes is commonplace. Sketchnoting is a way not be so bored with the meeting. 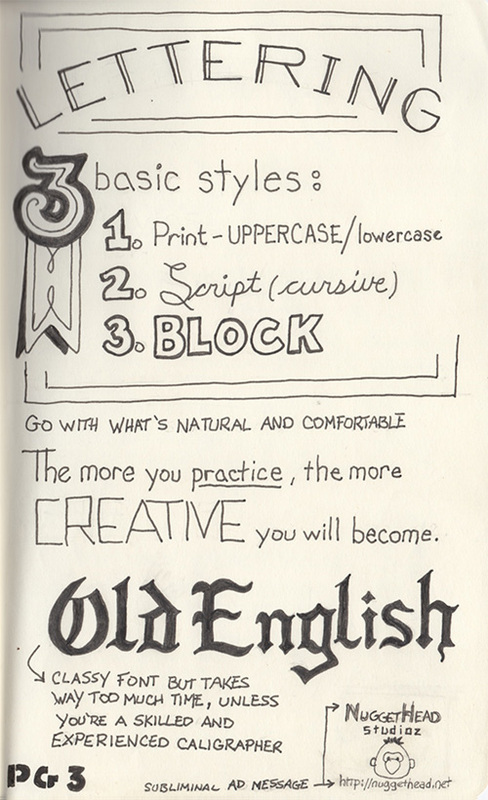 Besides, even if you are bored folks think you’re taking notes while you’re doodling away! I see you use the Moleskine books. Did you know they have one that you can use with Evernote. You essentially take a picture of the page with your iPad or phone and it converts it to a digital file for you. I have yet to try it out but was thinking of giving it ago. If you end up using it soon, I’d be curious how it performs other than just taking a photo of pages today from within Evernote. 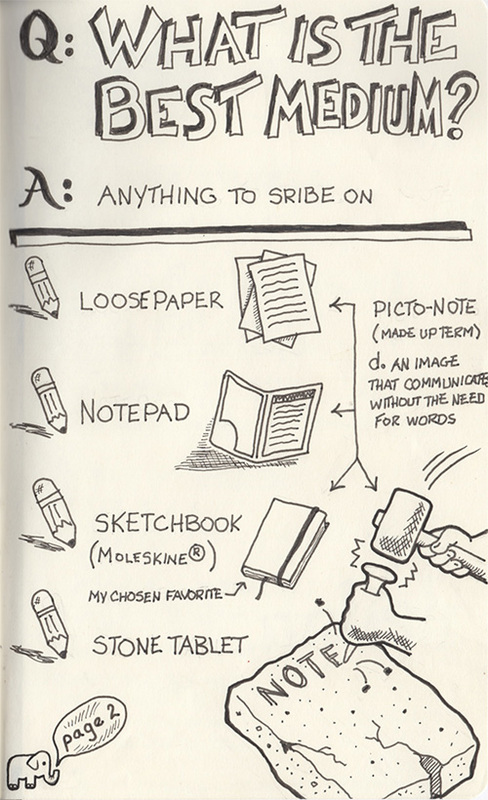 The only thing I gather from Moleskine.com is the quality of the paper is engineered to be captured better. Hey Allen! 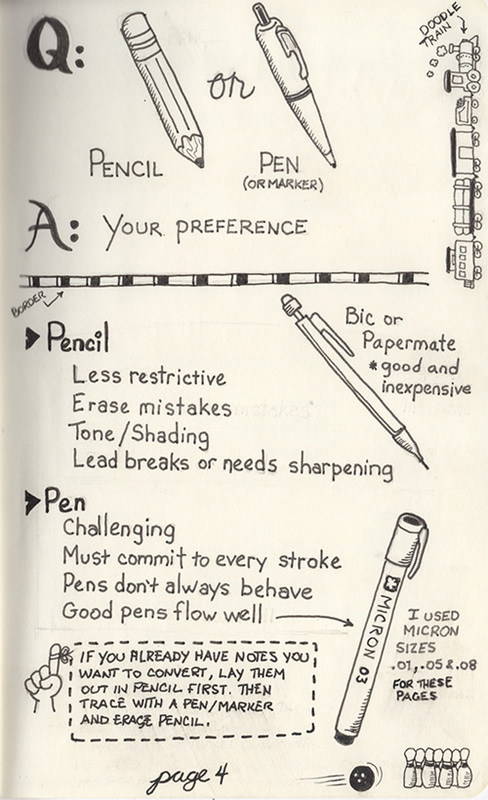 Thanks for sharing and glad you liked my ‘sketchy’ explanation of sketchnoting.